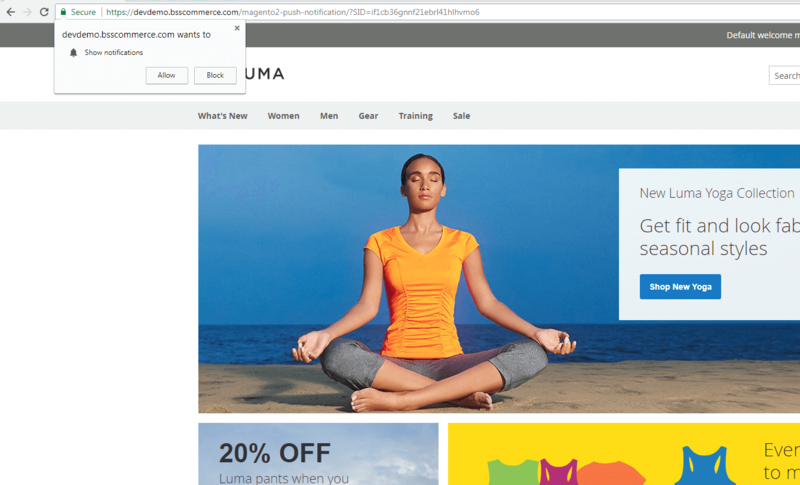 Magento 2 Push Notifications extension provides a quick and effective way to notify customers directly through their browsers. Notification emails can go straight to spam or junk mailbox, but Magento 2 Push Notifications extension provides a brand new way to make sure that customers won’t miss important notices from your website. Just by accepting the push notification offer, customers can receive all news at the earliest time, such as new promotions for products, new items on site, successful registration or login, wishlist notice, news of products in customers’ wishlist, etc. Please note that the push notification only works for https site. 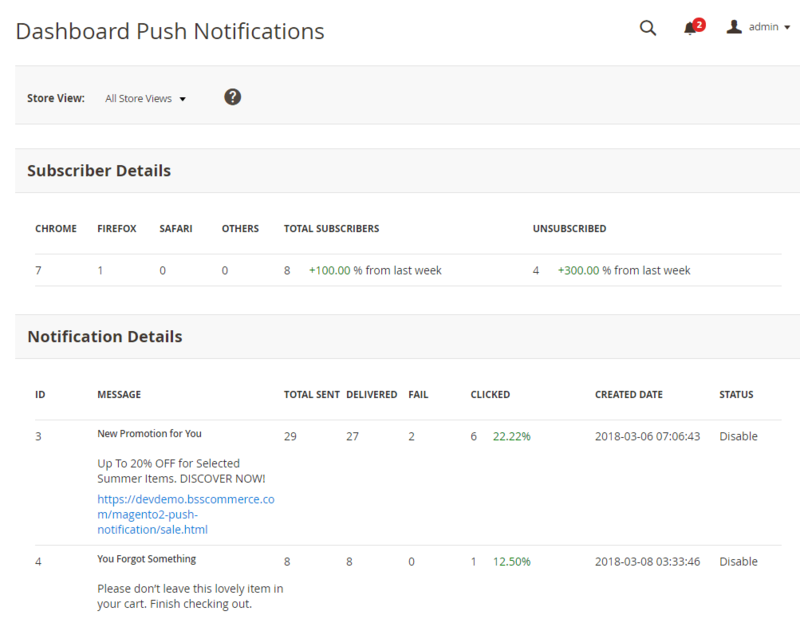 Magento 2 Push Notifications extension allows customers to register for your website’s notifications. The registered customers get instant notifications via their browsers. Customers can immediately read messages or notices from your website without having to visit it. The notification is displayed in the form of a small pop-up message on the top left of the screen. You can freely add new templates for push notifications. With Magento 2 Push Notifications extension, you are able to customize the content, add URL and upload image for the notification message. You can create unlimited types of push notifications. Push Notifications for Magento 2 extension allows you to determine when to display notification pop-up for customers. The time picker tool is the highlight features which can’t be found in other push notification extensions. All important statistics including numbers of clicks on the notification, subscribers, browsers and sent notifications are collected and presented in a smart and convenient report for you. Why Is Push Notifications for Magento 2 your must-have extension? Push Notifications for Magento 2 extension provides a brand new way to inform customers of important news. It has 10 times CTR (Click Through Rates) than the typical methods of using email. With push notification method, you can reach the customer fast and immediately when they are using the browsers. Web notification attracts customers’ attention, increase reach and traffic to your site. When you need to run a promotion on site, push notification is the perfect choice to catch customers’ attention. The notification is displayed in the form of a pop-up message with the link to the promotion. This method leads to considerably high click rate and conversion rate. You can also make use of the push notification to persuade customers to come back and finish checking out the items in their cart. This also reduces shopping cart abandonment. I've tried Magento 2 Push Notification extension from various suppliers, but that of BSSCommerce is the best without any errors. I'll come back for other extensions. The bss team works fast and effective. They install the extension and fix conflicts without charging any extra cost. 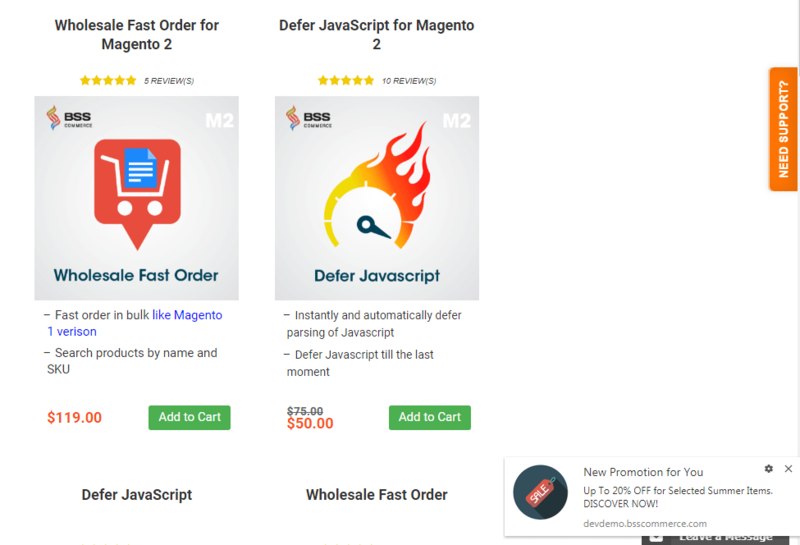 After having Magento 2 Push Notification installed on my site, I get more customers to come back and more sales also. Thanks!